Thanks to your support and enthusiasm for the return of 7th Sea, we’re thrilled to be nominated alongside many other wonderful games in this year’s ENnie Awards! You’ll find Pirate Nations, the 7th Sea Core Rulebook, the free 7th Sea Basic Rules and Mark Richardson’s wonderful map of Théah among the other nominations this year. It’s because of the hard work of the writers, designers, and artists that 7th Sea is back again. Folks like Mike Curry, Rob Justice, and Mark Richardson will be up for their first ENnie nominations, and we’d love to see them get the recognition they deserve. Voting is open here, now through 11pm EDT on July 21st. We’d love your vote! Here are the 7th Sea nomination categories for quick reference. Nations of Théah: Volume 2 in Print! As promised, we’re ready to ship print copies of Nations of Théah: Volume 2 out to our backers. Danielle Lauzon, as Lead Developer, did an amazing job bringing this book to print, hot on the heels of Volume 1, and we can’t wait for you all to see it in print. Congrats again to Danielle Lauzon and the crew of Nations of Théah: Volume 2! They’ve put together another beautiful book… one that might just show up at next year’s ENnies! While Nations of Théah: Volume 2 is shipping out to backers, we’re ready to release our next sourcebook preview… one that dramatically expands the world of 7th Sea. It’s time for The Crescent Empire! If for some reason your Backerkit doesn’t have the file, please message us via Kickstarter and we’ll get it sorted out for you. We can’t wait to get your feedback on our this book! We’ll be sending this book to the printer soon, so look for final PDFs before the end of the month, and printed books around the 1st of September. Gen Con is coming up soon, but we've got a few more releases before we get there. Stay tuned for information about replacement cards for the Pirate's Booty, the first two 7th Sea Novels in print and our July production update. Thanks! Crescent Empire is looking much better than the 1E one so far. The sorceries are national, but some are also able to be learned by people of the right rligion. well, they are hitting more of the diverse nature of the region. But I am nowhere near well enough versed in those cultures to say if they did a good job representing them. The important issue will be if they are fun to play and don't break a system. Really loving the feel of the Cresent Empire. And I will admit, I am biased due to my love for Dune. 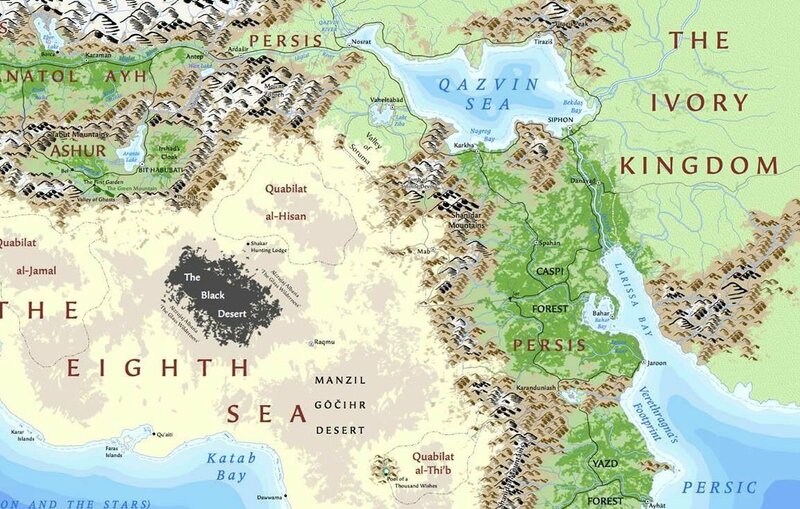 A wonderful preview map of The Crescent Empire by cartographer extraordinaire, Mark Richardson (click to see it in full glory).